Cardiff City ended a four-match Championship losing run as they thrashed bottom side Sunderland reports BBC Sport. A dire first half ended goalless but the first 10 minutes of the second half transformed the encounter. Callum Paterson headed Cardiff in front before Sunderland's Didier Ndong was sent off for fouling Junior Hoilett. Joe Ralls added the second goal, Paterson struck again and Anthony Pilkington got the fourth. That gave Cardiff their biggest winning margin since a 3-0 victory over Aston Villa in August and briefly lifted Neil Warnock's men back up to second in the table. By contrast, defeat marred what was something of a homecoming for Sunderland manager Chris Coleman, his first game back at Cardiff City Stadium since leaving his post as Wales boss in November. And although the 47-year-old had overseen some of Welsh football's finest moments at this ground - such as their 2015 win against Belgium and the celebration of qualifying for Euro 2016 - his Swansea roots meant the Cardiff fans greeted him with playful mockery rather than reverence. Sunderland were faced with an early barrage of free-kicks and long throws launched into their penalty area, but showed some threat when they counter-attacked at pace. 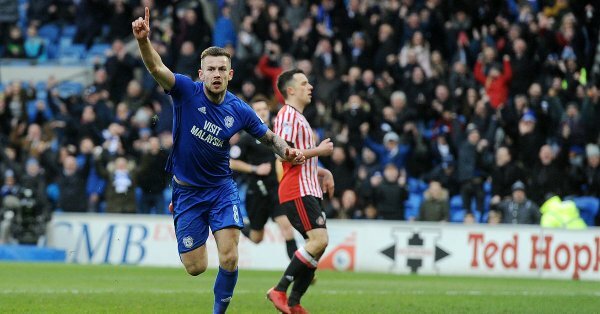 There were few chances in an even first half, the best of which fell to Cardiff as Ralls had an effort from the edge of the box brilliantly saved by Robbin Ruiter, before Hoilett curled a free-kick narrowly wide. If Sunderland felt relatively comfortable at the break, they soon unravelled. Their resistance was broken when Ralls' corner found an unmarked Paterson, who headed in via the underside of the crossbar to bring relief to the home side. Matters got worse for Sunderland when midfielder Ndong was shown a straight red card for a tackle that appeared to catch Hoilett high on his shin. The result was settled five minutes later as Kenneth Zohore shrugged off Jake Clarke-Salter, raced clear on the left wing and squared the ball to Ralls, who swept in a stylish first-time finish. Zohore also had a hand in the third goal, as his shot was saved by Ruiter only for the ball to fall into the path of Paterson, who finished smartly with his weaker left foot. Sunderland's misery was compounded in injury time as Cardiff's Yanic Wildschut - making his debut for the Bluebirds - set up fellow substitute Pilkington for a simple tap-in. Cardiff City: Etheridge, Richards, Morrison, Manga, Bamba, Bennett; Paterson, Ralls; Hoilett (Feeney, 82), Mendez-Laing (Wildschut, 58), Zohore (Pilkington, 82). Subs not used: Murphy, Halford, Tomlin, Damour. Sunderland: Ruiter; Jones, O'Shea, Clarke-Salter, Browning, Oviedo; Wilson (Cattermole, 45), N'Dong, Honeyman, Gooch (Asoro, 60); Maja (McManaman, 79). Subs not used: Steele, Love, Matthews, Robson.